You are browsing the archive for Open Research. 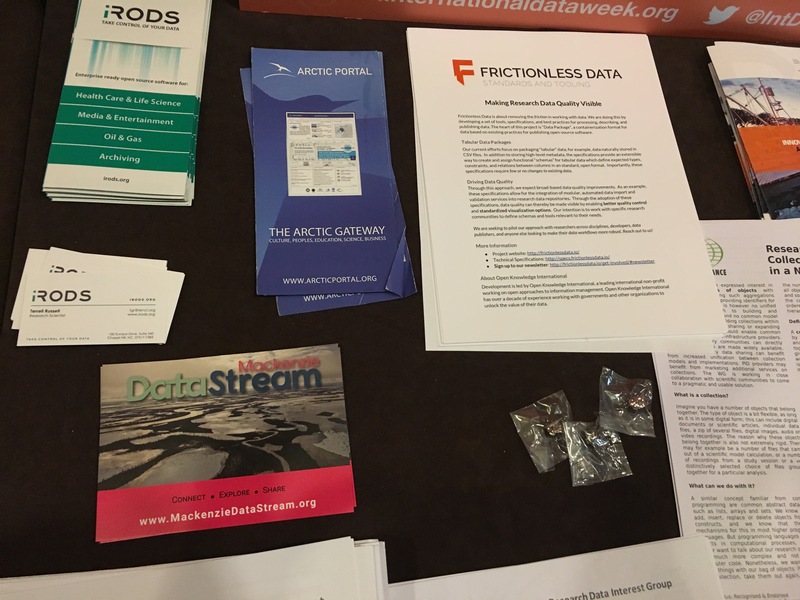 This blog has been reposted from Medium This blog is part of the event report series on International Open Data Day 2018. On Saturday 3 March, groups from around the world organised over 400 events to celebrate, promote and spread the use of open data. 45 events received additional support through the Open Knowledge International mini-grants scheme, funded by Hivos, SPARC, Mapbox, the Hewlett Foundation and the UK Foreign & Commonwealth Office. The events in this blog were supported through the mini-grants scheme under the Open Research Data theme. The notion that research funded with public resources should be made openly available to society has been consolidating in recent years and, consequently, public funding agencies are not only preferring but mandating the results to be published in open access. The National Institutes of Health (NIH) have pioneered in 2008 to implement the open access policy, followed by Harvard University in the same year, the National Academy of Sciences of China (2009), and the National Science Foundation (2011). Next, the Centers for Disease Control and Prevention (CDC), the US Defense Department and the space agency NASA, implemented in 2015 open access mandates. That same year, France launched the bill “For a Digital Republic”, and submitted it to public consultation. Funding agencies such as Wellcome Trust, CERN, UNESCO, Bill and Melinda Gates Foundation, and many others have established similar mandates. Many of them still determine that the contents published in OA shall be governed by the Creative Commons attribution license CC-BY, the least restrictive of all. Despite these international agencies, the Nepal government should also play a pro-active role in the open movement, invest more in R&D, nurture young researchers, develop a culture of research among the students and provide funding to new ideas and researches leading to new innovations. Open Access Week, a global event now entering its eighth year, is an opportunity for the academic and research community to continue to learn about the potential benefits of Open Access, to share what they’ve learned with colleagues, and to help inspire wider participation in helping to make Open Access a new norm in scholarship and research. It’s one of our favorite global event, We the team of Open Knowledge Nepal always love celebrating and organizing it because we believe Open Access and Open Research field need more advocacy and awareness in Nepal. We joined this momentum in 2014 with the help of Open Access Nepal and lead that momentum in 2015. This year to mark this global celebration, We did QA with some Open Access Activist of Nepal. The aim of doing this QA was to generate resources regarding Open Access and Open Research so, that newcomer entering this field can find and know about the momentum running in Nepal easily. We ask three Open Access Activist regarding their work, organization, and vision. Thanks to all three of them for giving us their valuable time and replying our question. 1) Brief about Nepal Library and Information Consortium (NeLIC)? The Nepal Library and Information Consortium (NeLIC) was established by a group of institutions with the idea of facilitating access to electronic resources to Nepali educational institutions. Its core area of activities is Open Access, Free and Open Source Software, Intellectual Property Rights, & Sharing of the available e-resources. More information can be found at www.nelic.org. 2) How is NeLIC using and promoting Information and Communications Technology (ICT) and Free and Open Source Software (FOSS)? NeLIC is promoting the use of ICT in libraries for better service and modernizing the library according to global trends. For that we recommend FOSS. Presently Koha, PMB, DSpace, GSDL, etc. are the FOSS being used in Nepalese library. 3) Brief about NeLIC Open Access Repository? Central OA Repository is a web archive run by Nepal Library and Information Consortium (NeLIC) for the collection, preservation, and dissemination of intellectual outputs of an institution or an individual. Outputs may be journaled articles, research reports, and conference papers in a digital form. Researchers and students will have access to these materials through a single-point open access system. 4) How can libraries be used by businesses to provide professional development opportunities? Libraries can be used by any professionals to enrich their professional knowledge and sharpen them by getting exhaustive and up to date information in the particular field. 5) How many institutes are currently the member of NeLIC and is the number increasing? Currently, there are 56 members in NeLIC. The number of members is open to all Nepalese institutions which have a library and /or which are involved in learning, teaching and research activities. So it is growing continuously. 1) Brief about Open Knowledge Nepal? A working group of Open Knowledge in Nepal. An open network of mostly young people working towards increasing openness in data, education, science, and other and increasing opportunities for many people. 2) Brief about Open Science & Open Research working group and their interconnection? Science is advanced by research. Research is a methodology with which all science progresses. These two are always interconnected. 3) When does a researcher satisfy the requirement for Open Access? Most important thing, at first, is a commitment by researcher themselves. But that can only the cause of open access so far. The researcher can study more about types of open access, find open access journals in their domain, talk about open access with their colleagues. 4) How do you see the current open science practice of Nepal? At least all journals in Nepal are Open access. 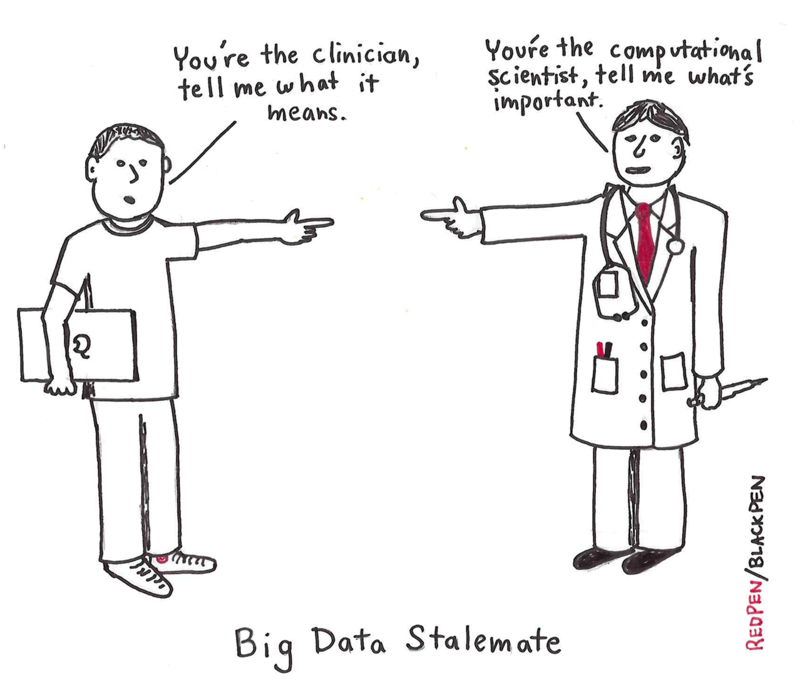 However, there is no culture of sharing research data among Nepali researchers. Practice is influenced by culture, and culture by practice. We need to sensitize researchers and academics about open access and open science in Nepal. If all government funded research in Nepal mandates publication as open access and sharing of raw data in an open license, it will increase open science practice. Movements take time and we have only just begun. There’s a lot to do. 5) What are the expected challenges? The motto of OA Button is: Push Button. Get Research. Make Progress. Open Access Journals: Open Access journals are the scholarly journals and publications that are available to the readers online without any financial, legal or technical barriers. OA journals are freely accessible to the readers. It essentially removes the price (licensing fees, subscription) and permission (copyright issues) barriers to a scholarly publication. Some OA journals are subsidized and are financed by an academic institution, foundation, or government itself while others are operated by the article processing charges (APC’s) obtained from submitting authors which are usually provided by their respective institutes. 3) What are the main factors that have led to the steady growth of OA publishing in Nepal? 4) How do you think this trend will develop over the next decade, and explain why? The gradual trend of OA publishing has been increasing over the years now and I am confident that we will witness a significant rise in OA publication over the next decade for the reasons mentioned above (People will eventually understand the benefits of Open publishing and how OA will help each group of people like students, researchers, entrepreneurs, doctors, patients and public). However, the recent statistics also reveal a dramatic growth of Open Access. Globally the collections of open access archives are now collectively an order of magnitude larger than the 10 million articles and this is just from Bielefeld Academic Search Engine (BASE). DOAJ showed an amazing 11% growth in the past in articles searchable at the article level – about half a million more articles today than a year ago. This past quarter DOAJ showed a healthy growth rate of 135 titles or added 1.5 titles per day. The internet archive now has more than 3 million open audio recordings. The Directory of Open Access Books added over 2 thousand titles in the past year for a current total of over 5,000 titles (60% annual growth rate) from 161 publishers (41% annual growth rate in publishers). The number of journals actively contributing to PubMed Central continues to show strong growth in every measure: there are 212 more journal active participants in PMC today than a year ago, a 10% growth rate; 170 more journals provide immediate free access, an 11% growth rate; 113 more journals provide all articles as open access, a 9% growth rate; and the number of journals with some articles open access increased by 123, a 31% growth rate. These statistics reveal that researchers and the general public are gradually being aware of the impossible subscription fees and the nobility Open Access brings into the lives of individual, family, society and a nation. People gradually understand that the fundamental aspect of education is sharing and locking knowledge and education will only harm. Researchers now realize that their work will be more recognized only if they prefer OA journals, they now realize that catastrophes like Ebola and Zika could be prevented with open access to research. The steep growth in the statistics is just the beginning and I am sure that we will see some serious hikes in a decade from now. 5) What will happen if a researcher does not make his work immediately Open Access accessible? 6) Where will the funding for OA publishing come from? Obtaining research grants from funding agencies is crucial for researchers to continue their work, supervise students and career advancement. Obtaining grants is directly linked to the researcher’s performance, mainly publications. Besides public funding, institutional and private foundations, opportunities dedicated specifically to fund – and reward – open research, open data and open software have emerged, especially in recent years. They are traditional funders, such as Wellcome Trust, NIH, and SPARC, which are allocating funds to open research, or new initiatives especially created with this view, as the Shuttleworth Foundation (established in 2007) and Mozilla Science Lab (2013), among others. The notion that research funded with public resources should be made openly available to society has been consolidating in recent years and, consequently, public funding agencies are not only preferring but mandating the results to be published in open access. The National Institutes of Health (NIH) have pioneered in 2008 to implement the open access policy, followed by Harvard University in the same year, the National Academy of Sciences of China (2009), and the National Science Foundation (2011). Next, the Centers for Disease Control and Prevention (CDC), the US Defense Department and the space agency NASA, implemented in 2015 open access mandates. That same year, France launched the bill “For a Digital Republic”, and submitted it to public consultation. Funding agencies such as Wellcome Trust, CERN, UNESCO, Bill and Melinda Gates Foundation, and many others have established similar mandates. Many of them still determine that the contents published in OA shall be governed by the Creative Commons attribution license CC-BY, the least restrictive of all. Despite these international agencies, the Nepal government should also play a pro-active role in the open movement, invest more in R&D, nurture young researchers, develop a culture of research among the students and provide funding to new ideas and researches leading to new innovations. During the past 2,5 years Open Knowledge has been a partner in PASTEUR4OA, a project focused on aligning open access policies for European Union research. As part of the work, a series of advocacy resources was produced that can be used by stakeholders to promote the development and reinforcement of such open access policies. The final two briefing papers, written by Open Knowledge, have been published this week and deal with two pressing issues around open access today: the financial opacity of open access publishing and its potential harmful effects for the research community, and the expansion of open and free scholarly communication platforms in the academic world – explaining the new dependencies that may arise from those platforms and why this matters for the open access movement. “Reducing the costs of readership while increasing access to research outputs” has been a rallying cry for open access publishing, or Gold OA. Yet, the Gold OA market is largely opaque and makes it hard for us to evaluate how the costs of readership actually develop. Data on both the costs of subscriptions (for hybrid OA journals) and of APCs are hard to gather. If they can be obtained, they only offer partial but very different insights into the market. This is a problem for efficient open access publishing. Funders, institutions, and individual researchers are therefore increasingly concerned that a transition to Gold OA could leave research community open for exploitative financial practices and prevent effective market coordination. Which factors contribute to the current opacity in the market? Which approaches are taken to foster financial transparency of Gold OA? And what are recommendations to funders, institutions, researchers and publishers to increase transparency? 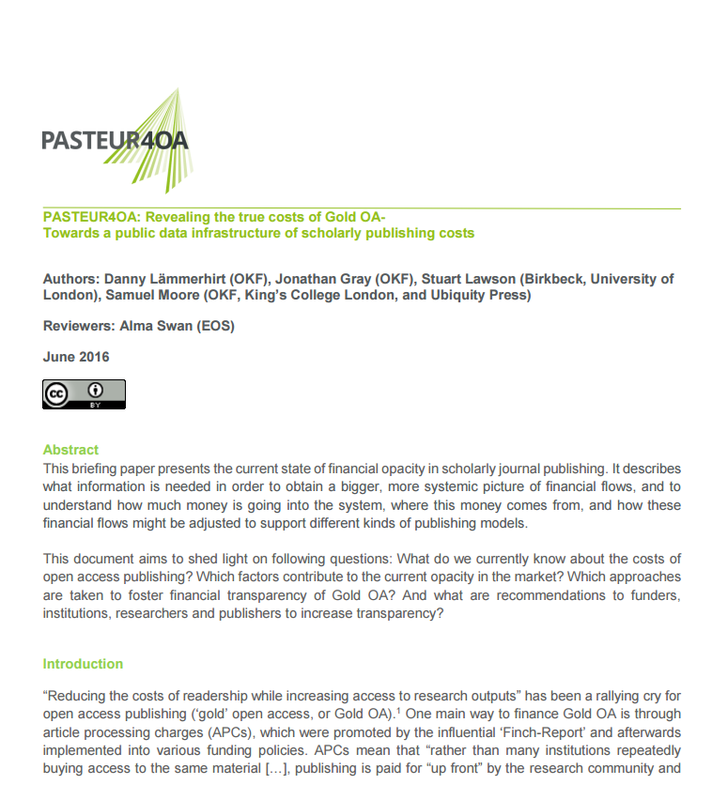 The paper Revealing the true costs of Gold OA – Towards a public data infrastructure of scholarly publishing costs, written by researchers of Open Knowledge International, King’s College London and the University of London, presents the current state of financial opacity in scholarly journal publishing. It describes what information is needed in order to obtain a bigger, more systemic picture of financial flows, and to understand how much money is going into the system, where this money comes from, and how these financial flows might be adjusted to support alternative kinds of publishing models. Why do scholarly communication platforms matter for open access? Over the past two decades, open access advocates have made significant gains in securing public access to the formal outputs of scholarly communication (e.g. peer reviewed journal articles). The same period has seen the rise of platforms from commercial publishers and technology companies that enable users to interact and share their work, as well as providing analytics and services around scholarly communication. How should researchers and policymakers respond to the rise of these platforms? 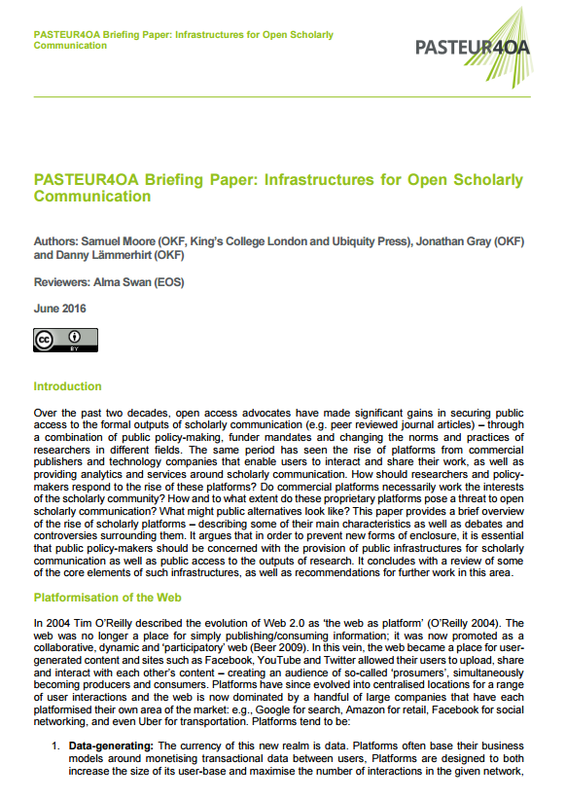 Do commercial platforms necessarily work the interests of the scholarly community? How and to what extent do these proprietary platforms pose a threat to open scholarly communication? What might public alternatives look like? The paper Infrastructures for Open Scholarly Communication provides a brief overview of the rise of scholarly platforms – describing some of their main characteristics as well as debates and controversies surrounding them. It argues that in order to prevent new forms of enclosure, it is essential that public policymakers should be concerned with the provision of public infrastructures for scholarly communication as well as public access to the outputs of research. It concludes with a review of some of the core elements of such infrastructures, as well as recommendations for further work in this area. Comments Off on Open Access: Why do scholarly communication platforms matter and what is the true cost of gold OA? Due to the ongoing crisis situation and political instability of the country, we were unable to celebrate Open Access Week 2015 like past years. so, because of this reason we planned to organize Open Access Workshop in collaboration with Open Access Nepal. The aim of an workshop was to discuss the importance of open access for student research, opportunities, capacity development and research trends. For more Information about Workshop Schedule and Objective please visit event page: http://np.okfn.org/2015/11/30/open-access-workshop/ Event Day: As expected, students of Bsc CSIT and engineering joined the workshop. Mr. Kshitiz Khanal, Open Science/Access working group team lead and Mr. Nikesh Balami, Open Government Data/Development working group team lead started the workshop by welcoming all participants & by congratulating Dr. Roshan Kumar Karn, Director of Open Access Nepal for wining Right to Research Coalition (R2RC) emerging leader award. After the introductory session, Dr. Roshan Kumar Karn started his presentation on the topic “Open Access & Open Access Movements in Nepal”, were he talked about the importance of Open Access Publishing, its importance & also gave some introduction about his community “Open Access Nepal”. Mr. Prakash Neupane was welcomed at stage after the presentation of Dr. Roshan. Mr. Neupane is ambassador of Open Knowledge Nepal and was giving presentation on the topic “Ongoing practices of research by student in Nepal”. To make workshop more interactive, Mr. Neupane wasn’t using any presentation slides & started his presentation by asking question with participant, “Why student so research?” He shared his experiences of doing research & also shared some ongoing practices with participants to provide them much needed motivation. Mr. Chandan Goopta, Co-Founder of theOpinio entered the stage after Mr. Neupane presentation. Mr. Goopta is one of the young researcher & was giving presentation on the topic “Gaps in student research”. During his presentation he highlights the different stages of research where most students do mistakes and also told participants to learn more about the difference of Interest, Strengths and Goals to be successful researchers. He shares his experiences of doing research in Nepal & underlines some gaps which students need to care while doing research. Last but not the least, Mr. Kshitiz Khanal was welcomed at stage for his presentation on the topic, “Tools and resources for students research” were he first highlights some facts on why people do research and shared bunch of resources with participants which they can use while doing research. He also discuss some about the ongoing research trends in Nepal. After the completion of presentation session, Mr. Nikesh Balami thanked all participant for joining the workshop & everyone moved for refreshment break towards the canteen.